DuPage Chairman Dan Cronin and State Senator Michael Connelly Hosting Health Fair TODAY! 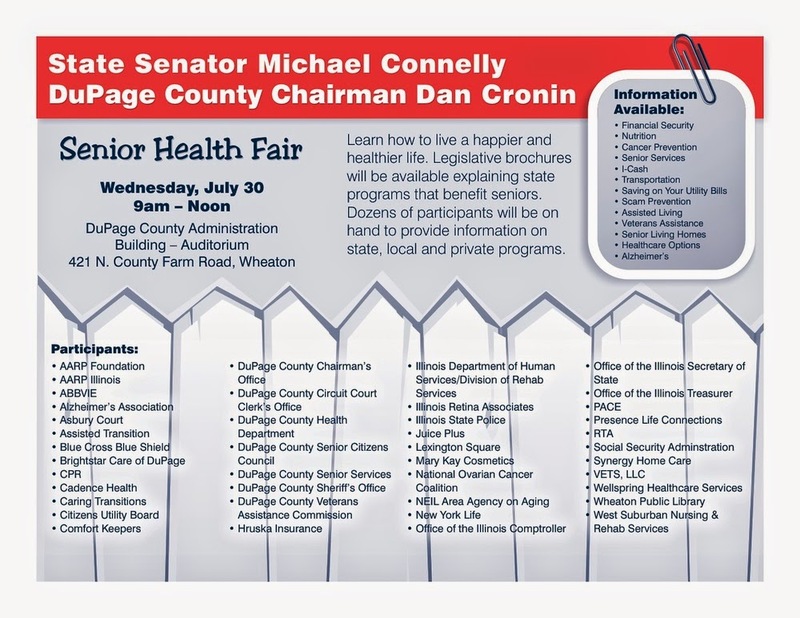 DuPage seniors are getting a two-for-one deal here as DuPage County Chairman Dan Cronin teams up with Illinois State Senator Michael Connelly to host a "Senior Health Fair" today! If you're out in Wheaton, make sure you head there. On Wednesday, July 30th State Senator Michael Connelly and I will be hosting a Senior Health Fair at the DuPage County Administration Building from 9 AM until noon in the auditorium. The health fair aims to help seniors live happier and healthier lives. Brochures will be available that outline state programs that benefit seniors, and dozens of organizations will be on hand to provide information on state, local, and private programs. Topics will include financial security, nutrition, cancer prevention, I-Cash, transportation, scam prevention, healthcare options, veterans assistance and MUCH more.